In six days, the summer will officially end however my list of summertime "to-dos" is still lengthy. Having been occupied with chores, family matters and occasional get-aways, I've been separated from my sewing machine more than I care to be. It is times like these when I turn to hand sewing as it ensures that I'll never be too far away from my craft. 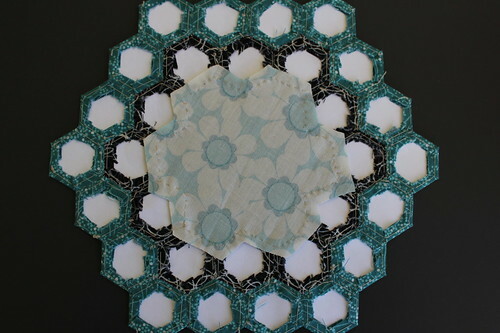 I've been working on these English paper pieced hexie medallions for quite some time now and have completed 20 or so. I've previously shown some of these in my initial post from nearly two years ago. I don't know how many I will eventually end up with but I will continue to make them until I tire of it. 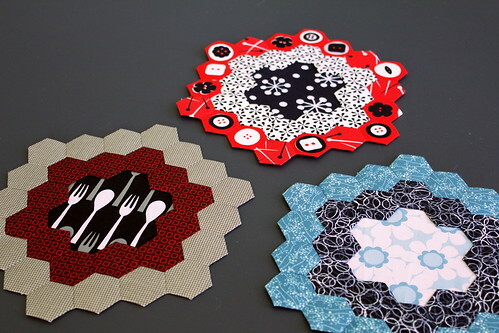 I was inspired to make these when viewing images on Material Obsession's blog. If you haven't been there yet, it is well worth the trip. I was particularly impressed by the style of this shop owner who has no fear when mixing color and print. Her bravado has encouraged me to extend a little bit beyond my comfort zone which is somewhat restrained. I use Paper Pieces foundations for this work. They are relatively inexpensive, accurate, durable and reusable several times over. They come in a large variety of sizes and shapes and can be ordered on line. I highly recommend them. 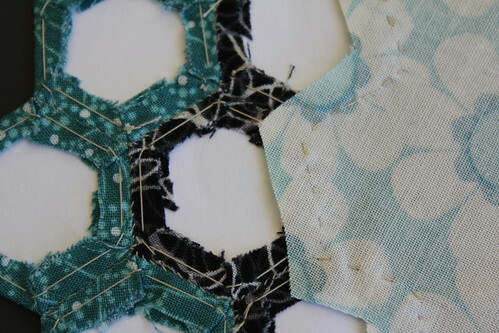 I'll continue with my hand sewing until things settle down and I get back to my beloved machine! I'll be sure to post more as they are completed. I was just about to ask that same question as Julierose did! What a fabulous update to this classic favorite! 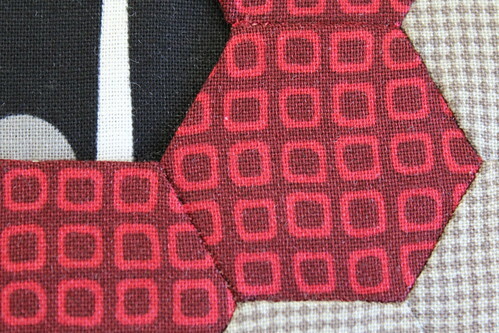 The center section is a single piece of fabric tacked to the back of the double ring of hexies. Easy peasy!!! Beautiful! !Your fabrics are so pretty that you put together! !